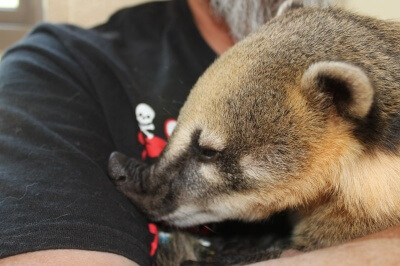 Let’s just rethink this whole animals smell thing………My Senses detect some smelly parts here, of course Coati Daddy is kinda furry too…So the lesson here folks is to bathe every day even if you don’t think you need too. Don’t make me have to sniff you out in public cuz I will do it…. YOU would stink even worse than me if I didn’t give you baths!